Back in May 2011 I reported the sale of the 31.1m motor yacht Hero, with Cape 4 Yachting in Greece introducing the buyer and here she is, back on the market with Vangelis Filiadis. 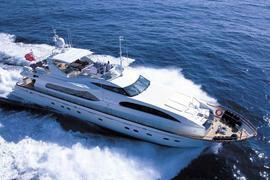 Hero was built by Italy’s Falcon Yachts in 2008. Her interior, by Deborah Kenny, accommodates up to 12 guests in three doubles plus two twin cabins, both with Pullman berths. Hero was originally commissioned by an experienced yacht owner and always professionally crewed, with no expense spared for her operation and engine room maintenance. Lying in Greece, Hero is asking €2.85.